This Day in Presbyterian History · November 5: It’s A Fact! November 5: It’s A Fact! The following editorial appeared on the pages of THE PRESBYTERIAN on November 6, 1924 [vol. 94, no. 45, pp: 3-4]. It is posted here a day early, as my co-author, Rev. David T. Myers, already has a post in place to run tomorrow. Anyway, the following article was provided without indication of authorship, but the Rev. David S. Kennedy [shown here at left] was editor-in-chief of THE PRESBYTERIAN at that time and thus was the likely author. Associate editors included William L. McEwan, Maitland Alexander, Samuel G. Craig, Clarence E. Macartney and J. Gresham Machen, and I suppose any of these men could also have authored this editorial. The editorial declares a basic truth about the foundation of the Christian faith, while also providing an example of a straight-forward apologetic method for the modern era. One of the outstanding characteristics of modern religious liberalism—that which as much as anything else differentiates between it and historical Christianity and especially between it and evangelical Christianity—is its open or implied denial of the factual basis of the Christian religion. This is particularly evident on the part of Dr. Fosdick, whose pen and tongue are doing so much to commend it to the present generation. His recent letter to the Presbytery of New York makes clear that his refusal to subscribe to the Westminster Confession is due not to the fact that he regards this creed as false as compared with other existing creeds, but rather to the fact that in the nature of the case, no creed can be true in any strict sense of the word. All creeds, all expressions of belief, according to Dr. Fosdick, are but the transient phrasing of what men have experienced within their own souls, with their fellows, or with God. That this holds good, in his estimation, of the doctrinal statements of the Scriptures as truly as it does of the Westminster Confession, is made perfectly clear in his recent book, The Modern Use of the Bible, which is being so widely and persistently advertised at the present time. Apart from the fact that Dr. Fosdick believes that the reduced Jesus left [to] us after literary and historical criticism has done its work was a real, historical person, there is virtually no recognition whatever of the factual basis of Christianity in this book. Everywhere it is maintained that the essential value of the Bible lies in its “reproducible experiences,” not in the historical facts or happenings it records. Dr. Fosdick has the Bible in mind as well as the creeds when he writes : “Christianity is a way of life, incarnate in Christ, that has expressed itself in many formulas, and will yet express itself in many more, and the world will ultimately choose that church which produces the life, whatever the formulas may be in which she carries it” (page 205). When it is considered that a few paragraphs preceding this he says, with the emphasis of italics, of the differences between Lutheranism, Calvinism, Episcopalianism, Methodism, Congregationalism, Unitarianism— defined as an “intellectual” revolt against an incredible metaphysic”—that “nothing matters in all this except the things that lead men into more abundant life” (page 201), it is evident that facts in the sense of events that have happened do not enter into his conception of Christianity at all in any vital way. That Dr. Fosdick speaks as a liberal rather than a Baptist is obvious. If proof of this were needed—though of course, it is not—it could be found in the also recent book, Christianity at the Cross Roads, by that truly representative Baptist, President E.Y. 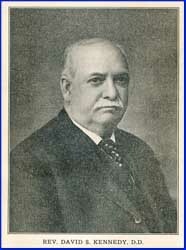 Mullins, of Louisville [President of the Southern Baptist Theological Seminary]. As President Mullins truly maintains, the present controversy is ultimately a controversy about facts. At the basis of the present attack on evangelical Christianity is an unwarranted denial of the Christian facts. Over against those for whom Dr. Fosdick speaks, President Mullins affirms that Christianity “is primarily a religion of facts. The facts of experience and life confirm the facts of history. If these are unstable, the whole structure is unstable. Doctrinal systems of various kinds have arisen as interpretations of the facts. These, of course, cannot all be equally true. But the facts on which these systems attempt to build contain the vital issue for modern controversy” (page 176). When President Mullins so speaks, he speaks for evangelical Christians everywhere. The religion we profess is a religion with a factual basis. A mighty series of facts that find their culmination in the incarnation, atonement and heavenly priesthood of Christ supplies the foundation of the Christian religion. They are not to be regarded as a terminus in themselves ; and yet, apart from them, there would not be, and could not be, such a thing as Christianity. It cannot be said too strongly or too often that Christianity is grounded in facts, that it is what it is because certain things actually happened in the past. Whoever rejects these facts or denies their eternal value and significance is, whether or not he realizes it, an enemy of the Christian religion. To perceive the place that facts in this sense occupy in the Christian religion is to perceive that the chief value of the Bible lies in the fact that it records these happenings. It is to perceive that the question of the historical truthfulness of the Bible is a question of the first importance for Christianity. Compared with these facts, the moral and spiritual lessons the Bible teaches, the ideals it inculcates, and the religious experiences it relates are matters of secondary importance. It is to perceive also that a non-miraculous Christianity is just no Christianity at all. We can eliminate the miraculous only as we eliminate the facts that lie at the basis of the Christian religion. Our choice, therefore, is not between a miraculous and a non-miraculous Christianity, but between a miraculous Christianity and no Christianity at all. Again, it is to perceive that doctrines enter into the very substance of Christianity. A religion based on facts is necessarily a doctrinal religion, inasmuch as its facts have meaning only as they are interpreted. We may go further and say that the existence of a doctrinal authority is essential to a religion based on facts. How can we be assured that we rightly understand the meaning of these great facts unless we possess an authoritative interpretation of those facts? No one values the Bible aright unless he realizes that it contains not only a record of the great facts, apart from which there could be no such religion as the Christian religion, but an authoritative interpretation of those facts. Give the facts no interpretation and they will not give us Christianity; give them an interpretation other than that of the New Testament, and they will give us something other than Christianity. There is but one Christian interpretation of these facts, and that was given by Christ and His apostles. Yet again to perceive the factual basis of Christianity is to perceive the sense in which it is a redemptive religion. It is to perceive that it is a redemptive religion, not in the vague sense characteristic of other religions, but in the particular sense that it offers salvation from sin, conceived as guilt and power and pollution, through the expiatory death of Jesus Christ. Christianity comes to us telling us, first of all, not what we must do to save ourselves, but what Christ has done to save us. At the heart of the Christian religion is the conviction that Christ bore our sins in His own body on the tree. Apart from this fact, there is no redemption in the Christian sense of the word. Other considerations might be mentioned, but these are sufficient to indicate the extent and degree to which facts are constitutive of the Christian religion; and thus to make clear that no system of thought and life that ignores or denies these facts is rightly called Christianity.